As we enter a week where further market turmoil is likely against a background of further tensions between the US and China over the Huawei arrest, the climax of the Brexit debacle, and the yellow vest protests in France. 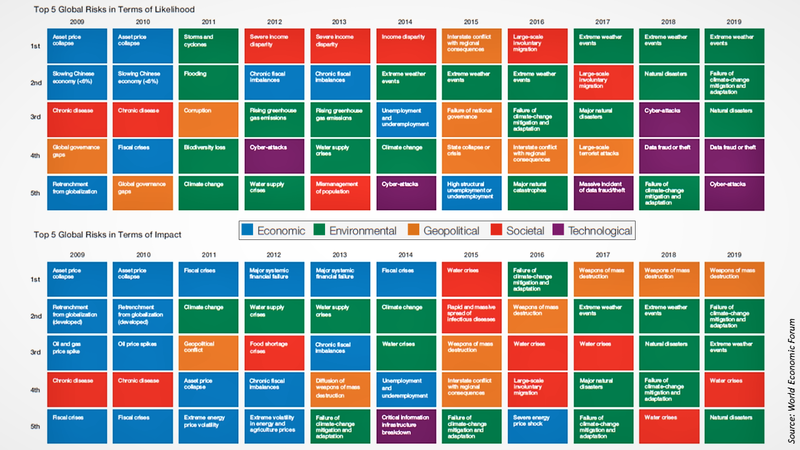 All these issues can and will be resolved eventually but they pale in comparison to the political inaction over the latest climate change reports. The US government, in the form of the United States Global Change Research Program (USGCRP), in a report in November concluded that “the evidence of human-caused climate change is overwhelming and continues to strengthen, that the impacts of climate change are intensifying across the country, and that climate-related threats to Americans’ physical, social, and economic well-being are rising” and warned that “these impacts are projected to intensify—but how much they intensify will depend on actions taken to reduce global greenhouse gas emis­sions and to adapt to the risks from climate change now and in the coming decades”. Of course, the Orange One again demonstrated his supreme myopic attitude with the dismissal “I don’t believe it”. We now have the black comedy of oil producing states such as the US, Russia and Saudi Arabia arguing over whether to “welcome” or just “note” the latest IPCC report this week at the UN climate talks, known as COP24. 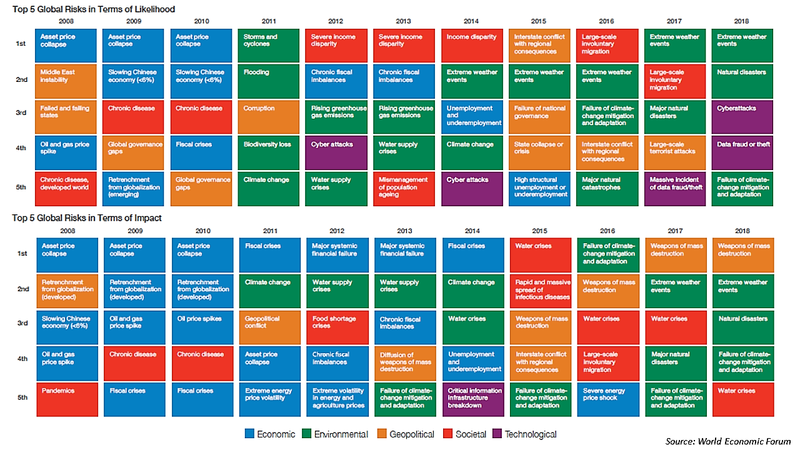 The IPCC report on the impacts of a temperature rise of 1.5°C was launched last October and is a sobering read. 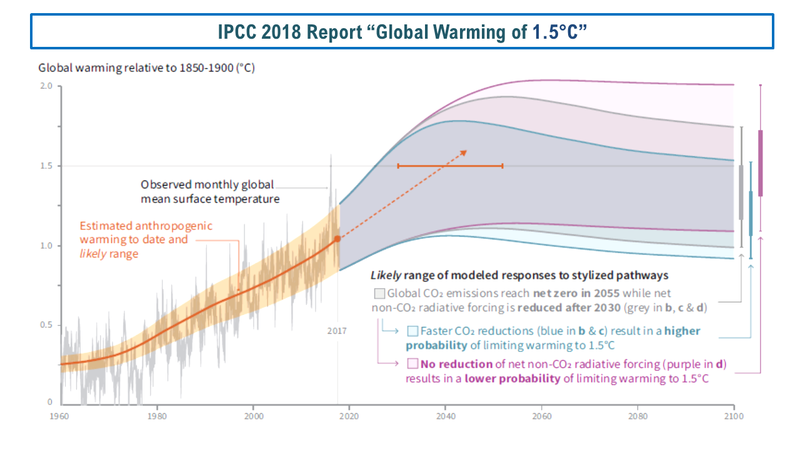 The IPCC again states with a high level of confidence that “human activities are estimated to have caused approximately 1.0°C of global warming above pre-industrial levels, with a likely range of 0.8°C to 1.2°C” and that “global warming is likely to reach 1.5°C between 2030 and 2052 if it continues to increase at the current rate”. In order to avoid warming above 1.5°C, the world needs “global net anthropogenic CO2 emissions decline by about 45% from 2010 levels by 2030 (40–60% interquartile range), reaching net zero around 2050 (2045–2055 interquartile range)”. For limiting global warming to below 2°C, emissions need to “decline by about 25% by 2030 in most pathways (10–30% interquartile range) and reach net zero around 2070 (2065–2080 interquartile range)”. Let’s face it, given the current political leadership across the globe, such declines are just fantasy. And I find that really depressing. The plea of David Attenborough at COP24 last week for leaders in the world to lead looks set to fall on deaf ears. Attenborough worryingly stated that “the continuation of our civilisations and the natural world upon which we depend, is in your hands (i.e. our leaders)”. We’re pretty much toast then…. It’s been over a year since I posted on climate issues (last post here after Trump’s withdrawal from the Paris Agreement). A recent study by a group of scientists warned that even if the carbon emission reductions called for in the Paris Agreement are met, there is a risk of Earth entering “Hothouse Earth” conditions. A “Hothouse Earth” climate will in the long term stabilize at a global average of 4-5°C higher than pre-industrial temperatures with sea level 10-60 m higher than today according to the scientists. 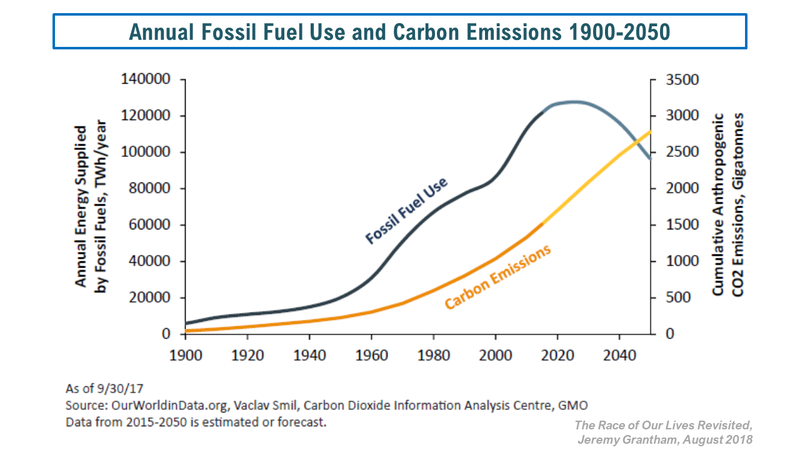 “Human emissions of greenhouse gas are not the sole determinant of temperature on Earth. Our study suggests that human-induced global warming of 2°C may trigger other Earth system processes, often called “feedbacks”, that can drive further warming – even if we stop emitting greenhouse gases,” says lead author Will Steffen from the Australian National University and Stockholm Resilience Centre, adding that “avoiding this scenario requires a redirection of human actions from exploitation to stewardship of the Earth system”. The best-selling author of “Sapiens” and “Homo Deus”, Yuval Noah Harari, makes the observation that “the hand of the market is blind as well as invisible, and left to its own devices, it may fail to do anything at all about the threat of global warming or the dangerous potential of artificial intelligence”. This is one of the themes he returns vigorously to in his new book “21 Lessons for the 21st Century”, a collection of previously published essays. It is therefore heartening to see such an influential and intelligent financial professional as Jeremy Grantham of GMO pushing the issue as an important one for investors to consider in our daily activities. This talk from Grantham and the accommodating presentation are well worth spending some time on. His arguments are articulated further in this August GMO white paper, The Race of Our Lives Revisited, an update on his 2013 paper. 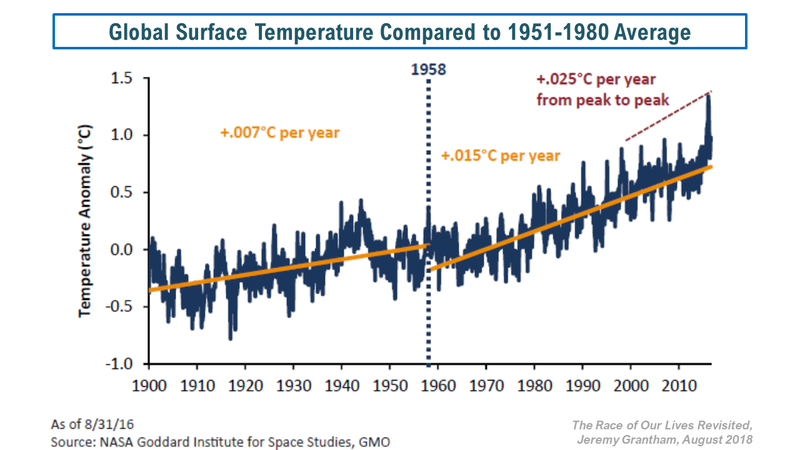 Grantham states that “the truth is we’ve wasted 40 or 50 years since the basic fact about manmade serious climate damage became known” and “we’re moving so slowly that by the time we’ve fully decarbonized our economy, the world will have heated up by 2.5ºC to 3ºC, and a great deal of damage will have been done”. 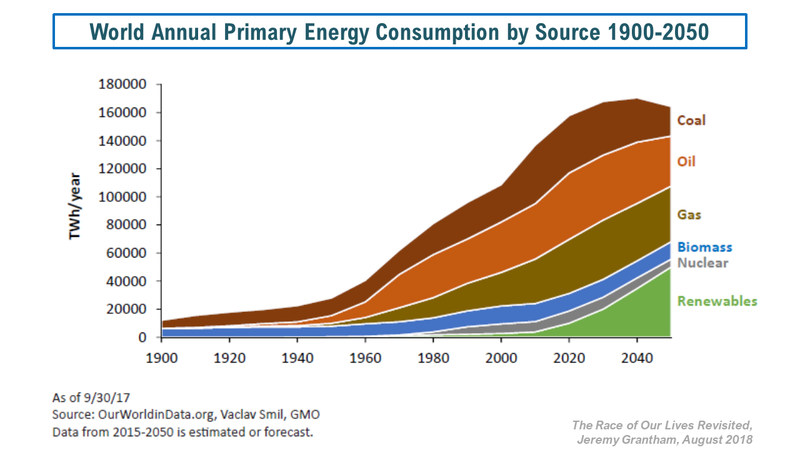 Grantham highlights the declining costs of alternative energy like solar and wind and the advances made in battery costs. Notwithstanding these advances, progress is too slow, as the graphs below show. Depressingly Grantham concludes that “in all probability we will reach our 2ºC target by 2050, and we will be fighting tooth and nail – with any luck, with carbon taxes and an improved attitude – to keep it below 3ºC by 2100”. Compounding the climate issue is continued population growth, declining agricultural productivity and increased soil erosion. Like Harari, Grantham argues that “the greatest deficiency of capitalism is its complete inability to deal with any of these things that we are talking about even though it can handle the millions of more mundane factors that go into producing a workable economy, far better than planned economies”. Grantham makes a passionate argument for investors to divest themselves of negative climate impact firms, such as the oil producers, and to do more in our personal lives to promote green changes, like buying electric cars. In the absence of real political leadership in our world, which looks likely to continue for some years yet as the populist and nationalistic political dead end we are currently travelling on plays out, voting with our actions seems the only thing we can do. As Grantham concludes, we all need to “get to it”.